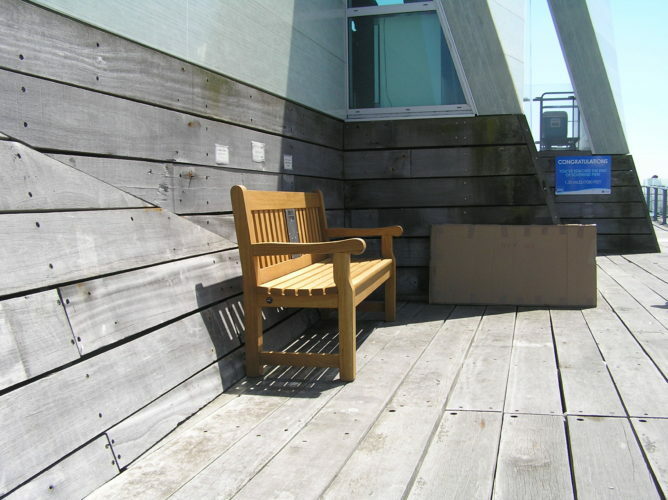 Now new audio on the listening bench installed in Southend-on-Sea! The recordings on the bench were updated in October 2018. The clips come from interviews with members of U3A (University of the Third Age) groups in the Southend Area, recorded by U3A members. The sound clips feature memories of this seaside town over the twentieth century, including day trips; dancing at the Kursaal; and even memories from a water ballet dancer. The full-length interviews have been deposited at the Essex Sound and Video Archive and can be heard on request. The bench is by the Royal Pavilion at the end of the Pier, looking out over the water. The recordings on the Southend bench were prepared by a team of volunteers from a number of U3A (University of the Third Age) groups in the Southend area as a U3A Shared Learning Project in partnership with the Essex Sound and Video Archive, with the support of Southend-on-Sea Borough Council. Find out more about the U3A. Audrey Stirling introduces the clips on the listening bench. Coral Kathro shares memories of childhood family day trips to Southend-on-Sea. Shirley Barnes describes the process of white-weeding; Marion Everitt explains the notable cars that were transported to the continent from Southend Airport; and Margaret Christian shares memories of a childhood boat trip at Southend, complete with special sweet treats! Rita Wordley remembers dancing at the Kursaal, and Brian Theedom describes the shops and cafes that used to be at Victoria Circus in Southend. Liz Sullivan was a water ballet dancer at the open air swimming pool in Southend. She shares some of her memories here. John Smart describes the sea water baths that used to be near the Pier, and Tony Everitt talks about the Mods and Rockers that descended on Southend in the 1950s-1960s.